Crohn's disease is a chronic (long-term) inflammation of the digestive tract. The inflammation causes uncomfortable and bothersome symptoms and may seriously damage the digestive tract. The cause of Crohn's disease is unknown. Genetic, infectious, environmental, and immune system causes have all been investigated, but a single cause has not been identified. Crohn's disease has no known cure. 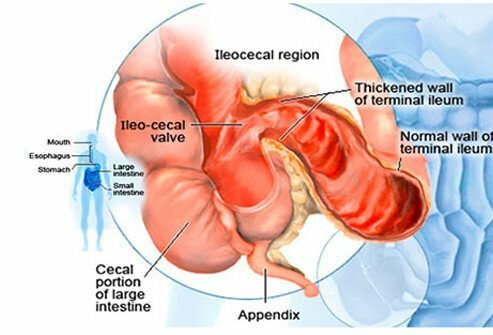 Fistulas (abnormal connections with other organs) and abscesses (pockets of swollen or dead tissue that may become infected) commonly form, and surgery is sometimes necessary to remove the diseased bowel, drain abscesses, and repair fistulas. Treatment is focused on reducing the inflammation, thereby relieving symptoms and preventing complications. The mainstay of treatment is the use of drugs to decrease inflammation. Good nutrition is essential because nutrient absorption may be impaired. Antibiotics may be needed after surgery or if infection occurs. Mesalamine is generally better tolerated than sulfasalazine. The newer aspirin-like anti-inflammatory agents are unique, because they release the active drug in specific areas of the small or large intestine, thus allowing doctors to choose a drug based on the site of inflammation. How aspirin-like anti-inflammatory agents work: These drugs are used in people with mild disease. Like aspirin, aspirin like anti-inflammatories reduce inflammation and pain by inhibiting a variety of immune reactions in the body. Who should not use these medications: Individuals who have peptic ulcer disease, severe renal failure, or allergy to aspirin or aspirin like products should not take aspirin like anti-inflammatories. Those with allergy to sulfa drugs should not take sulfasalazine. Use: These drugs may be administered orally or by rectal enemas or suppositories. Drug or food interactions: Aspirin like anti-inflammatory agents may increase the risk of bleeding when administered with other drugs that alter blood coagulation, such as heparin. Side effects: Aspirin like anti-inflammatories may be toxic to blood cells and may cause nausea, vomiting, abdominal cramping, and/or constipation. How corticosteroids work: These drugs decrease swelling and inflammation by suppressing immune response and are used when Crohn's disease suddenly worsens. Who should not use these medications: Individuals who have allergy to corticosteroids should not take them, nor should anyone with peptic ulcer disease, liver impairment, or viral, fungal, or tubercular infections. Uses: Corticosteroids are administered by various routes, such as oral, rectal, or injection. The goal is to use the smallest dose that will control symptoms. The length of treatment should be for the shortest time possible in order to lower the risk of developing side effects. Drug or food interactions: Many drug interactions are possible. Contact a doctor or pharmacist before taking new prescriptions or over-the-counter medications. Aspirin, nonsteroidal anti-inflammatory drugs, such as ibuprofen (Advil, Aleve, etc. ), or other drugs associated with stomach ulcers may increase the risk of developing stomach ulcers. Corticosteroids may decrease potassium levels; therefore, caution must be used when taking other drugs that decrease potassium, such as diuretics (furosemide [Lasix]). Side effects: Ideally, these drugs are used for only short periods in order to control sudden flares in symptoms. Long-term use is associated with serious side effects, such as osteoporosis, glaucoma, mental changes, and, in prepubertal children, diminished bone growth. After prolonged use, doses must be gradually decreased over weeks to months to avoid corticosteroid withdrawal syndrome. How immunosuppressants work: This group includes a wide variety of agents that work in many different ways, but they all interfere in the immune processes that promote inflammation. Who should not use these medications: Women who are pregnant or breastfeeding, and individuals who have allergy to immunosuppressants should not take them, nor should anyone with alcoholism or preexisting bone marrow or blood toxicities. Methotrexate can cause fetal abnormalities (teratogenicity) and should not be given to women of child bearing age. Use: These drugs can be administered by oral tablets or capsules or by injection. Drug or food interactions: Use of other immunosuppressants increases the risk of infection and increases toxicity to bone marrow or blood cells. Many drug interactions are possible. Contact a doctor or pharmacist before beginning a new prescription or over-the-counter medication. Side effects: Immunosuppressants are not safe during pregnancy and may cause bone marrow or blood cell toxicity. Patients with impaired kidney or liver function may need lower doses. Methotrexate may cause pulmonary toxicity. As mentioned previously, methotrexate can cause fetal abnormalities (teratogenicity) and should not be given to women of child bearing age. How biologic drugs work: These agents inhibit key factors responsible for inflammatory responses in the immune system called TNF (tumor necrosis factor) blockers and are used for moderate-to-severe Crohn's disease. Who should not use these medications: Individuals who have allergy to a specific biologic agent should not use it. Those with allergy to mouse protein should not use biologic agents. People with moderate-to-severe heart failure should not take doses greater than 5 mg/kg. Use: Infliximab is administered as a 2-hour intravenous infusion in doctors' offices. Initially, patients receive 3 doses within a 6-week period; thereafter, they receive a dose every 8 weeks to maintain the effect. Humira is a twice monthly subcutaneous injection that is usually self-administered. Cimzia is a once a month intramuscular injection. Drug or food interactions: Use of other immunosuppressants increases the risk of infection. Side effects: These drugs may increase the risk of infection, particularly when other immunosuppressants are used at the same time. There is a risk of reactivation of latent tuberculosis (TB) and hepatitis B. Individuals with heart failure may experience worsening of heart disease. Biologic agents may cause fever, rash, headache, or muscle aches 3 to 12 days after administration. Over a period of time, patients' bodies may produce antibodies against infliximab, thereby decreasing the drug's effectiveness. Humira and Cimzia are derived from human antibodies to anti-TNF and hence, may be used in Remicade failures. Diarrhea that waxes and wanes, and may contain blood, pus, or mucus. Crampy or steady pain in the lower part of the abdomen or around the belly button. Farrell, Richard, J. MD. "Overview of the medical management of mild to moderate Crohn's disease in adults." UpToDate. Updated Mar 17, 2015. What treatments have been effective in treating Crohn's disease? What aspirin like anti-inflammatories have been effective in treating Crohn's disease? What corticosteroids have been effective in treating Crohn's disease? What immunosuppressants have been effective in treating Crohn's disease? What biologic drugs have been effective in treating Crohn's disease?